The war 1864 resulted in the disappearance of the multinational Danish state. Denmark developed into a national small state and got a part of Southern Jutland in form of Schleswig back. Prussia grew into the expanding German Empire which later sank and developed then into the Federal Republic Germany we know today. Therefore, the war 1864 is also a central landmark in the European history. If you are ready to occupy the History Centre, then we are ready to offer you a very special adventure. Fascinating, entertaining, but also really serious. The house was designed by the architects Ernst Lohse and Michael Freddie (1. place in an architectural competition). The area is about 1 000 m² big and is distributed over two wings in V-shape whose tips are directed westbound and to the road. The house appaears unusual and is – inside and outside – full of symbols. What the symbols exactly stand for, is up to every guest. The house needs to be seen toegther with the Dybbøl Mill (Dybbøl Mølle). The mill is a round and friendly symbol of peace; the History Centrer, on the contrary, is a sharp and intrusive symbol of war. Its body is sunken into the ground in a skewed way as the blown up concrete remains of the Danish powder magazines in the area. From the inside of these torn up redoubts, colorful symbols for weapons and flags stand out. Inspired by earlier periods is the panoply (a range of wall –mounted weapons) which is placed in a chaotic and non heroic way. The inside is charaterized by the material wealth of the 19th century and its “joy of construction” with bricks, brass, rough iron, concrete and beaten gold surprise-details. The burnt timber remains of the with grenades hit Danish block house contradict the deep, navy blue night sky and are supplemented by wrought iron works, odd grids, profiles and sunny yellow walls in the Dannebrog hall. Therefore, the building is absolutely unique and invites you to go on a journey of discovery. Odd constructions with sharp and overthrown flats, palisade stakes which burst through the walls, and cornices which rack suddenly give our guests an impression of how the war and its chaos were like. 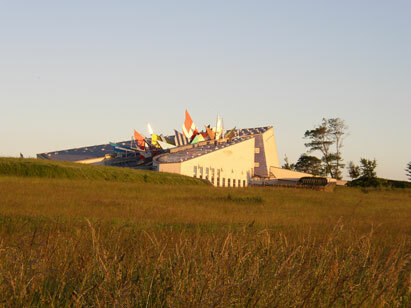 The building contains three halls: The auditorium (with the introduction movie), the cinema with the movie “The Day of the Assault”, the exhibition hall together with the diorama with a tableau of a Danish communication trench. Directly attached to the main building are two situations reconstructed: The situation behind the front, and the situation in front of the front. Behind the front, the soldiers’ town is shown and various barracks types which were about 1 km behind the redoubt in a Danish barracks camp can be seen. This is also the centre of our reenactment during the peak season and for pedagogical pupil activities. 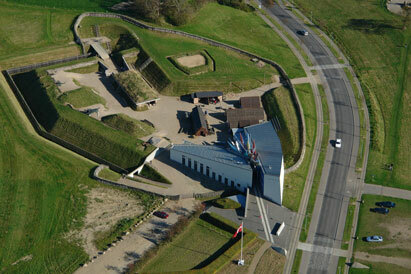 The front is illustrated with main parts of a Danish redoubt including rampart, trench, several cannon emplacements, a block house (the redoubt’s safe room), two concrete powder magazines and the redoubt’s entrance via the rolling bridge.